The Langham knows how to make afternoon tea a special occasion year-round, but the “Love Christmas Afternoon Tea” during the holidays takes the cake. Choose from a variety of elegant confections like the “Golden Ball” with hazelnut gianduja cremeux, orange confit and Rocher coating, or the “Snowflake” with coconut mousse and passion fruit marshmallow. Merlot Angus beef minced pie and Port wine-glazed duck foie gras ingot make up the savouries, all presented on a three-tier glass stand to echo the glass house that will be sitting pretty in the iconic Langham lobby. Go deluxe and enjoy a glass of Champagne or a festive cocktail. A prime spot for sipping tea and taking in the view of the city’s magnificent skyline, the Lobby Lounge at the InterContinental is pouring a cup of Christmas cheer this season with Executive Pastry Chef Christian Gonthier’s festive tea set. Throughout December, revel in the festive environs of the Lobby Lounge, complete with carollers and live music, while nibbling on passionfruit white chocolate dome, raspberry chocolate log and festive macarons. Executive Chef Maxime Luvara has created luscious savory items including a dungeness crab bun with yuzu cucumber dressing, and turkey and foie gras tree bread, just for starters. If you’re going to do afternoon tea, you may as well make it extra special with a stellar view and setting. ToTT’s and Roof Terrace checks the boxes with sweeping views of Victoria Harbour and a pleasant roof terrace on the 34th floor of The Excelsior. Their tea set tempts with mini delicacies such as foie gras eclair and Croque Monsieur, paired with freshly-baked scones and pastries. Take this all in with a sparkling glass of Moët & Chandon Champagne, a bit extra, but so worth it. A “Dazzling Ferris Wheel” is the star of the afternoon tea at Upper Bistro and Bar over in TST’s Popway Hotel. Sample sweet after delicious sweet from a golden Ferris Wheel laden with mini matcha mousse, green tea cheesecake and chocolate bon bons. Pan-fried black tuna canape with caviar, parma ham and melon with salmon roe, and mini wagyu burgers make up the savoury front. Upgrade to a flavoured latte or macchiato, or a fruity tea, to complete the experience. Just as intriguing is the “Brilliance of Pearls” tea set, served in a four-tier transparent jewellery box with gold lining, pearls and glimmering handles. Open the drawers to reveal the goodies inside like mango Napoleon, palmier, mushroom vol au vent and more, plus glam cocktails. Afternoon teas at COCO are known for being a chic affair, from the stylish cafe/patisserie setting with plush, comfortable chairs, to the steel handbag-shaped three-tier stand the delectable desserts are served on. This festive season, COCO is presenting “Mischievous Little Things” in the form of “Jolly Fairy Sweets” like Kumamoto chestnut Mont-Blanc profiterole and “Nordic Savoury Delights” such as decadent mini lobster in puff pastry with avruga caviar. Wrap it all up with a special drink we bet you’ve never had before, a “Jolly Purple Yam Latte”. When: November 1-December 30 Monday-Friday (3.00pm-6.00pm) *except December 24, 25 and 31; available Saturdays and public holidays at WHISK. A bright setting that looks over a lush garden with calming water features, and you don’t have to get too dolled up? Sounds ideal for spot of tea. Kerry Hotel starts pouring early, with a festive afternoon tea from November 21 until New Year’s Day. Chef Julien’s savoury favourites with a Hong Kong twist and delicate pastries are just the right size to enjoy every last one without going overboard. 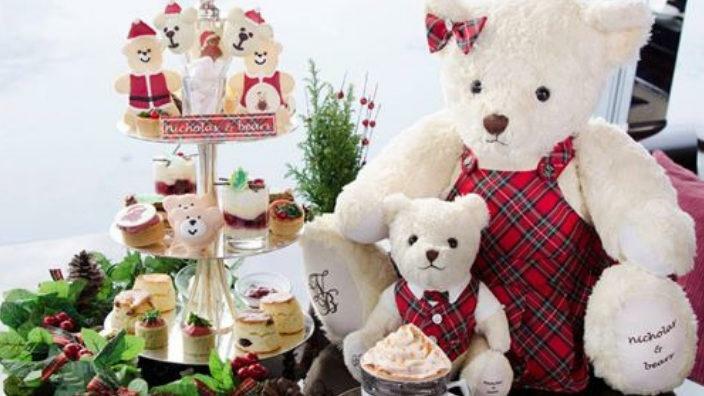 Spend the holidays in the stars at Lion Rock’s “Shining Stardust Afternoon Tea”. It’s a galaxy-themed affair, with sparkly cakes, purple-hued desserts in pretty glassware, finger sandwiches dusted with edible glitter, and colourful cocktails. And because it’s Christmas, there’s a gift in store (until Santa runs out, that is): the afternoon tea set for two comes with a a bareMinerals gift set (valued at $350) containing mini make-up, so you can touch up after wiping the delicious crumbs from your lips. Feast your eyes not only on the charming holiday bites at GREEN, but on the eye-popping vertical garden (one of the largest in Asia) that you’ll dine under. Among the savouries to indulge in are smoked salmon tart, taramasalata blini, and pastrami Reuben sandwiches, plus creamy chocolate tart, cute gingerbread cookies and Christmas macaroons to please your sweet tooth. Refresh between bites with homemade lemonade, espresso drinks, or a choice of 17 varieties of tea. And for a tipsy tea outing, there’s Strawberry or Chocolate Coffee martinis and free flow Champagne. Cost: $288 for one + 10%, $546 for two (December 1-21); $318 + 10% for one, $588 + 10% for two (December 22-31); add $38 for mocktails; add $48 for cocktails; add $78 for free flow Saint Louis Blanc de Blancs Brut N.V.; add $298 for free flow G.H. Mumm Cordon Rouge Brut N.V. Yes, it says gin parlour in the name, but this eclectic haunt in The Landmark has one of the most whimsical afternoon teas in town, and this Christmas, it’s inspired by “A Christmas Carol”. “A Christmas G & Tea” is worth booking an appointment with Dr Fern for some seasonal gourmet delights and tea (some boozy). Gingerbread cake, cannoli with rum raisins, and red wine poached apples along with a selection of soothing teas will cure any ailment, or they can prescribe a “Gin & Tea”: Bombay Sapphire East, passion fruit, lychee, orange, rose hips, jasmine tea, black tea and syrup. Christmas Eve and Day visitors will get a lobster roll with melon and yuzu butter with their tea sets. Both are favourites for weekend brunches and daily lunch buffets, and these gems at the Mandarin Oriental also do fantastic afternoon teas. Come by a bit early during the festive season to admire the beautifully-decorated lobby with a towering tree, then relax at Clipper Lounge or Cafe Causette with some warming teas and treats: dainty sandwiches (this time of year they’re filled with turkey and cranberry, of course) and sweets like mince pie or chestnut and coffee pound cake. The highlight is always the famous 1963 Mandarin Cheesecake, even better when paired with a glass of “R” de Ruinart Champagne. The legendary Lobby is one of our favourites for afternoon tea, if not for the attention to detail in the fine table settings and perfectly crafted cakes, but for the musical accompaniment of the Lobby Strings. It’s always a special event, even more so at Christmas: on selected dates in December, The Lobby is hosting the “Teas of Hope Classic Afternoon Tea”, a children’s tea with holiday-themed entertainment and surprises. Each tea set comes with a “Nutcracker” festive pin, with 12% of each set sold donated to Make-A-Wish Hong Kong, and US$5 will be donated to Shanghai K Charitable Foundation’s support programmes at the Sir Horace Kadoorie Youth Development Centre. Take your tea and scones in the clouds on the 103rd floor of the luxurious Ritz-Carlton. Café 103 provides a stunning outlook of the city and despite its elegant surrounds, has a relaxed feel perfect for whiling away the afternoon. People come here for the creative rotating afternoon tea sets, and in December the seasonal tea takes on a Nutcracker theme. Sit back and enjoy the view, along with all sorts of tempting savouries and sweets elegantly served at your table – there’s even more at the live dessert station (from December 23). Stuff yourself like Santa would with a host of afternoon tea nibbles like the requisite scones and finger sandwiches, but with a festive feel, at Café on the 1st at The Excelsior. Take in awesome harbour views as you devour cakes and savoury pastries, or go all out at the Afternoon Tea Buffet for some sumptuous world cuisine including Japanese eel fried rice, Malaysian satay, Asian-style noodle soup, mini Portuguese egg tarts and more. Bring the kids to this one, as Mr Claus will be taking time out of his busy schedule to hand out gifts on Christmas Day.